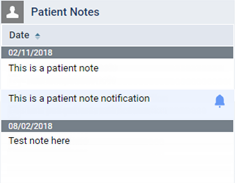 You can delete a patient note as needed. On the Patient menu, under General, click (or tap) Overview. The patient's Overview page opens. Click (or tap) the Patient Notes box. Note: By default, notes are sorted chronologically in ascending order (oldest first). If you change the sort order, that sort order will persist for your user account until you change it. The Patient Information page opens with the Patient Notes tab selected. On the Patient menu, under General, click (or tap) Patient Information. The patient's Patient Information page opens. Click (or tap) the Notes tab. On the Notes tab of a patient's Patient Information page, click (or tap) a note's Delete button .